The pentagram is a symbol as important as it is misunderstood. My intention here is to clarify certain aspects, symbolic, historical and practical. 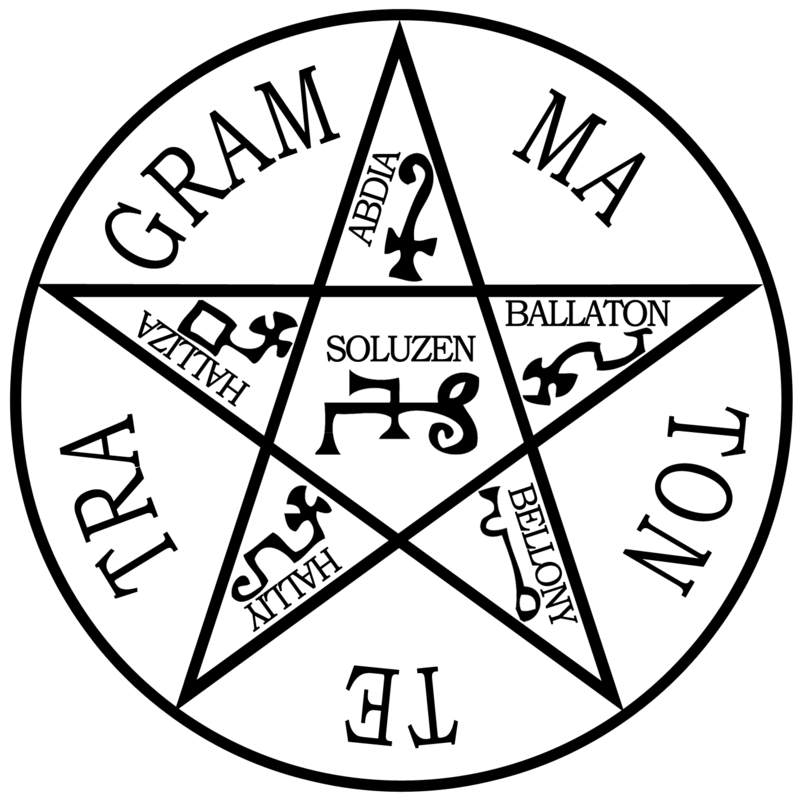 While reading this article you shall learn about the pentagram’s significations, purposes, who used it and what it got to be associated to. Essentially, the pentagram is a simple model of a stellated polygon (geometrical figure of more than four points) which can be drawn cursively with a single line. As such, it is an interesting and important figure in geometry as well, having perfectly equal angles and representing the number five which, as we shall see, has a multitude of significations. The pentagram is a very old symbol which appeared in many civilizations over time, having radically different significations. The first historical apparition of this symbol appeared, according to current archeological discoveries, in Mesopotamia, more precisely in the city Ur from Sumer. 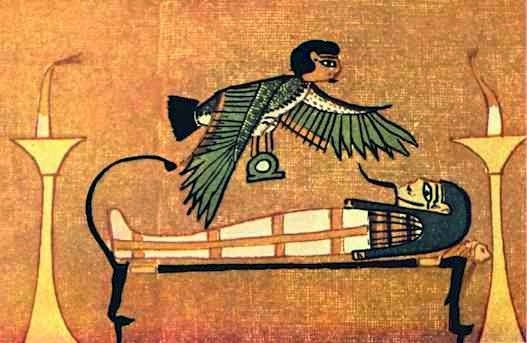 The written evidences come from approximately 3500-3000 B.C. The symbol was initially used as an ornament on bowls and pots and it is connected to the creation of the first spoken language. Here, the pentagram signified the UB, which can be translated as “angle”. A bit later, also in Mesopotamia, this symbol began to represent royalty and later the Imperial power. The symbol was later took by the Jews at the time of the Babylonian exile, thus becoming a symbol of truth and wisdom, being put in direct connection to the Torah and Pentateuch (The Five Books of Moses: Genesis, Exodus, Leviticus, Numbers, Deuteronomy). 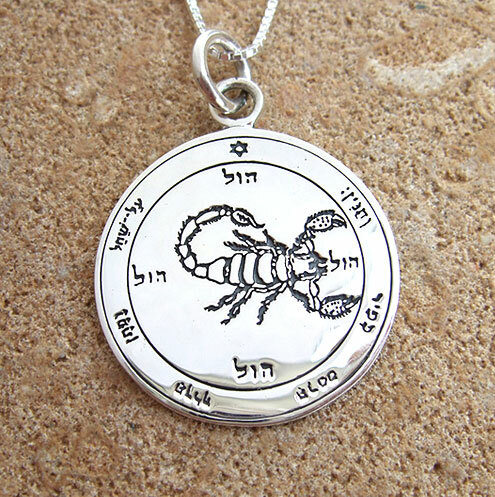 In ancient synagogues, it even appears in equal rivalry with the hexagram. 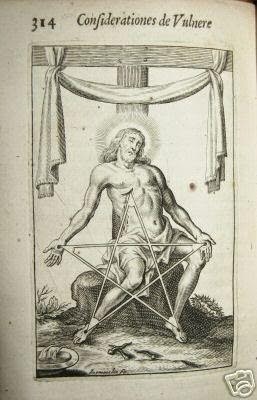 The pentagram was called Seal of Solomon or Star of Solomon (Kochav Shlomoh) and the hexagram was known as the Star of David or Shield of David (Magen David). Both symbols had a major importance in Judaism, being used by the two Israelite kings (father and son). However, the pentagram was more popular, being found on a series of cups and objects belonging to the Hebrew kingdom. There is also a great amount of shekels (ancient jewish coins) that have the five pointed star. The connection to king Solomon is also known from the apocryphal tradition coming from the Testament of Solomon, in which the king held a ring engraved with a pentagram that controlled winds, angels and demons. According to legend, this ring was offered to king Solomon by the archangel Michael to bind the demons and help him build the Temple. In ancient Greece the pentagram also had an important and respected role, being considered a symbol of geometrical perfection. It was called “Hygeia” or “Hugieia” meaning “Health” and was identified with the goddess of health who had the same name. For the Druids, the pentagram represented the head of God and the Celts used it as a symbol of the goddess Morrigan. For the first Christians it represented the five loaves of bread given by Jesus, the five wounds of Jesus and was also a symbol of the five senses. In the year 312 C.E., Emperor Constantine wore a pentagram and the Chi-Rho symbol as sigil and amulet. Also in Christianity, the pentagram appears in the 14th Century in the poem Sir Gawain and the Green Knight where it decorates the shield of the hero, Gawain. In the poem’s symbolism, the pentagram represents the five knightly virtues, Gawain’s five senses and the dexterity or Gawain’s fingers, but also a symbol of Solomon. Beginning with the Middle Ages, the pentagram symbolized truth and protection against evil spirits. It was used as an amulet of protection at the doors and windows. In 1533 Cornelius Agrippa brings the work De occulta philosophia libri tres, the masterpiece of western occultism. 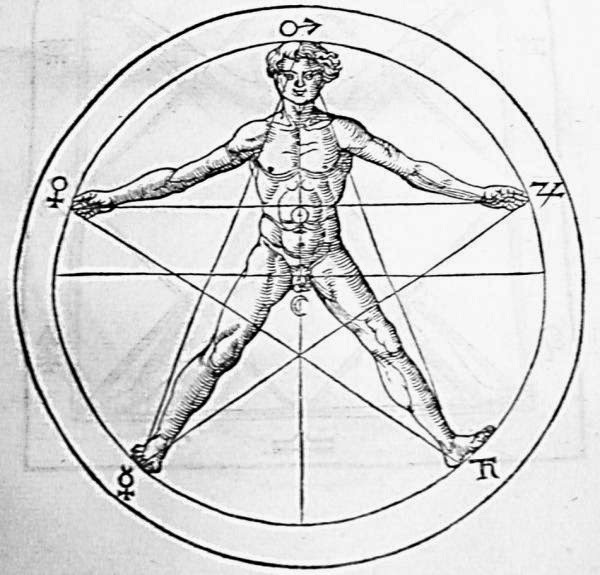 In his work, the pentagram appears together representing the human body and its proportions, putting in practice the old Pythagorean teachings. Here, Agrippa adds certain correspondences with the celestial bodies. 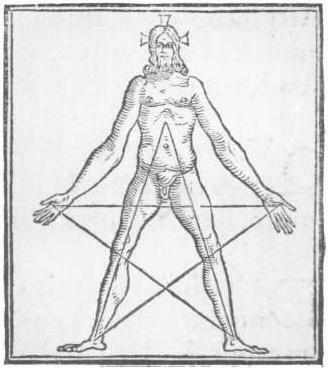 Agrippa’s drawing was later used by the majority of people interested in mysticism and occultism, by magicians and rosicrucians, by occultists such as Papus and Eliphas Levi. Paracelsus also had a good impression of it, describing it as one of the few symbols who are truly powerful from a spiritual point of view. 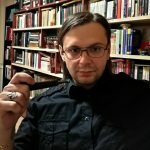 While speaking of Eliphas Levi, we must specify that his thoughts on the pentagram were different, viewing it as both a symbol of the “divine” but also a symbol of the “devil”, depending on the position of the pentagram. Levi was inspired by a painting (Witches’ Sabbath or The Great He-Goat) by spanish painter Francisco Goya. However, he confused Baphomet with the goat of Mendes, an ancient egyptian god who was the protector and creator of the city of Mendes. The symbol of Baphomet is said to come from the Knights Templar, warrior monks who fought for the protection of the Christian pilgrims. It is said that, while they were fighting the Arab world, they could not understand and pronounce the word Mahomet (Mahomed/Muhammad) and could barely pronounce the letter “h”, thus transforming it to “f”, resulting in the word Mafomet. And because the “m” sounded like a “b” it became Bafomet. When the Pope found that the Arab world worshiped a certain Bafomet and the Templars have been converted to this, he ordered their deaths, although Bafomet is the same as Mahomed, the holy prophet of Islam. Another theory, based on the Chinon Parchment indicates that the Templars were sometimes blasphemous in case they were captured by the Saracens, because they were forced to commit apostasy (renunciation of their religion) and spit on the cross, but the Templars declared the only did it “in words only, not in spirit.” Michael haag suggests that indeed, the simulation of worshiping Baphomet was part of the initiation rite of the Templars. 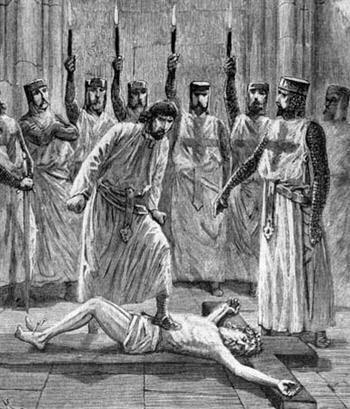 The Knights Templar confessed under torture that they worshiped and idol called Baphomet, but their descriptions and confessions differed and some even denied it. It is most likely that this is an invention, because there is no specific proof showing that the Templars did in fact worship Baphomet and the Latin Rule (rules of the Templars) did not speak of anything like that nor did any other documents of the medieval period of the Templars. The oldest representation of a goat head fixed into a pentagram appears in an engraving at page 387 in Stanislas de Guaita’s book La Clef de la Magie Noire. Stanislas de Guaita was a convinced enemy of black magic and satanism. His book is part of a multi-volume in which he expresses his ideas and accusations towards Satanism and his enemies such as writer Joris Karl Huysmans. 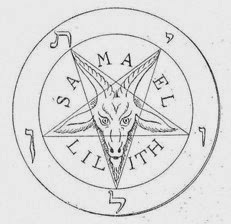 Eliphas Levi mentions the name of the demon Lilith and de Guaita’s image incorporates the name in the graphic along with the name Samael. De Guaita doesn’t say anything about these names, he only repeated and continued what Eliphas Levi said. 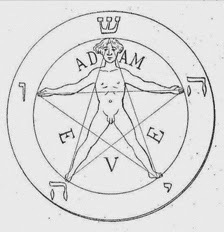 Another similar representation appears in the book Handbook of Magic & Witchcraft by Charles W. Olliver together with another version, this time representing man having inscribed the names Adam and Eve, and four hebrew letters Ye Hod Vau He (Yehowah/God) and at the top the Hebrew letter Sheen which stands for Yeshua (Jesus) which literally means “savior” or “deliver” (God delivers a savior). The pentagram with Baphomet later started to represent the Church of Satan organization led by Anton LaVey. During his research, LaVey found the book A Pictorial History of Magic and the Supernatural by Maurice Bessy initially published in 1961. 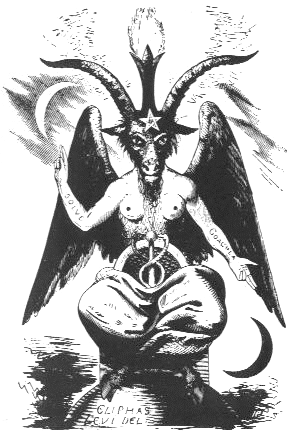 The book’s cover had an image called “Sigil of Baphomet.” From that, Anton LaVey had decided that it is the most suitable representation for a Satanic church and used the model, modifying it only a little. The Church of Satan symbol was finished in December 1969 along with the publication of The Satanic Bible. 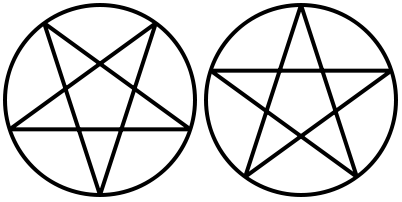 A bit latter the pentagram was adopted by a new religion called Wicca. This new religion is a sort of “ecological” witchcraft based a lot on nature worship. Although this religious movement appeared sometime between 1940 and 1950 at Gerald Gardner’s initiative, the pentagram’s use in Wicca appeared later in the 80’s. To them [Wiccans] the pentagram is a representation of the natural elements, the five points corresponding to water, earth, fire, air and spirit. In conclusion, we understand that this symbol, like any other symbol, has various significations for every civilisation and even for every individual. It is important what it represents to us, what inspires to us, what use can it have for us and how important it is to us. * Below you have the sources that I have used to write this article. They contain in certain conditions other information as well, which can be of interest to you if you wish to read more, so don’t hesitate to consult the links.